The raspberries I planted last year are suddenly heavy with fruit. I picked almost a kilo the other day and I’m feeling really pleased. Not that I can take much credit for this, raspberries are such an easy fruit to grow. Apart from planting them in the first place, banging a few poles along the row and stretching wires across them to provide some support to tie the canes too, this fruit hasn’t called out for much attention. Raspberries are really a weed as they send out their runners all over the place. I’ve allowed wild strawberries to make ground cover underneath the raspberries and the runners just grow up through this dense strawberry leaf carpet. Both seemingly grow effortlessly so I feel no compunction as regards thinning it all out now and again, it will grow back before you know it. In the autumn some of these runners are destined for the allotment, so I’ll have even more fruit in the years to come. This is all part of the bigger picture, to create the jammin equivalent of Willy Wonka’s Chocolate Factory, aka Gloria’s Glorious Jam Emporium. 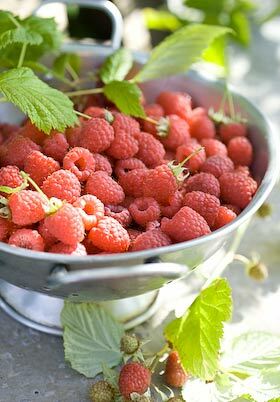 Raspberries smell amazing as they cook and fill the whole house with a wonderful fragrance. I decided to use them to make the raspberry and peach jam from my book, Fruits of the Earth as it is one of my favourites. The jams I prefer usually fit into the tart, robust flavours category, but this jam isn’t quite like that, but gentler and especially fragrant and summery. This is also one of the rare exceptions when I have to buy in an ingredient that hasn’t been grown nearby. I don’t yet have access to any local peaches or nectarines so must, for the time being, content myself with sourcing the best ones I can find anywhere I can find them. At least by making a special visit to Adam Scotts in Coleford, the only independent fruit and veg shop in the forest, I shouldn’t feel bad about buying fruit from further afield. It is such a great shop and I often go there to photograph the display out front. They do sell locally sourced produce when they can. Recently they have been selling flat peaches, which seem to have become all the rage; they must be if they’ve reached Coleford already. Apart from these peaches looking fabulous, they taste great and seem to be RIPE when you buy them, ripe but still firm, amazing! A far cry from those rock hard supermarket peaches. When you bite into a flat peach, their flesh is white and it is almost enough of a treat to just stick your head in the bag when you get home and draw in their high peachy scent. These were the best peaches at their peak on the day, so I chose them. The best thing about harvesting your own fruit is getting it straight into the jam kettle, without a moment to lose, so none of the freshness is lost. The recipe starts by heating the raspberries to release the juice, then you push it through a sieve or food mill to collect the puree. The raspberry pulp and seeds I collected is now macerating in a Kilner jar of white wine vinegar, where it will stay for the next month or so. The resulting raspberry vinegar will be delicious for summer salad dressings, so nothing wasted. In the few days since I picked the last raspberries, another batch have ripened. I haven’t netted any of my fruit bushes. Luckily, with so much fruit around, the birds are being kind for once. Place the raspberries in a pan over gentle heat to release their juice and mash with the back of a spoon. Once they are soft and juicy, push through a sieve or process with a food mill using a fine mesh, collecting the puree. (As mentioned above, you can use the seeds and pulp that remain in the sieve to make raspberry vinegar.) Place the puree and 500g (1lb 2 oz) sugar and the juice of 1 lemon in a pan, bring to a simmer, stirring all the while until the sugar has dissolved, then pour into a glass bowl, cover and leave overnight in the fridge. Skin the peaches by placing them one by one in boiling water for a minute or 2, then into cold water. The skins should slip off the fruit easily with the help of a sharp knife. Halve and remove the stones then chop the peaches into pieces, keeping them quite chunky. 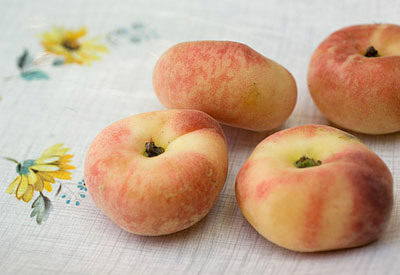 Place peaches with remaining sugar and lemon juice in a pan and heat gently to a simmer, stirring to dissolve the sugar. Pour into a glass bowl, cover and leave over night. The next day, simply combine the raspberries and peaches in a preserving pan, heat and boil rapidly until setting point is reached. (This should only take 10-15 minutes.) Leave to cool for 5 minutes then stir to distribute the peach pieces, before pouring into hot sterilised jars and seal. By all means miss out the ‘leaving fruits, sugar and lemon in glass bowls overnight’ part if you wish to speed up the process. 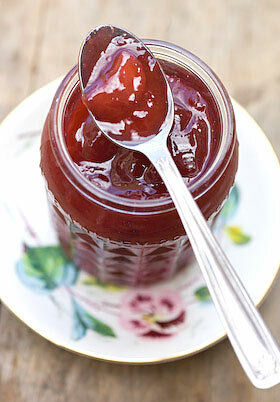 This method of preparing jams in stages sometimes improves flavours. Also, though this recipe will make a jam that keeps well, to be especially careful and improve keeping time, by all means follow the usual canning procedures by using suitable preserving jars and hot water processing for 10 minutes if you are into canning. Oh what a lovely haul! We’ve planted raspberries in our garden for the first time this year, so not expecting a huge haul but the first few berries have been much enjoyed. The canes have been confuse by the weather as our autumn fruiting variety started giving us ripe berries back in June but ho hum! I love flat peaches, and could never easily find them here in the UK, so have been gorging on them recently – a small local newsagent/ grocer sells them for about 25 pence each so each time I walk past I buy some more! Your garden sounds like heaven. Both the color and texture of this jam are inspiring, and the way my mouth is watering right now says enough about the flavors. If I lived closer I’d be knocking on your door!